2018 Quadro 3 Edelweiss. Picture credits - Quadro. Submit more pictures. 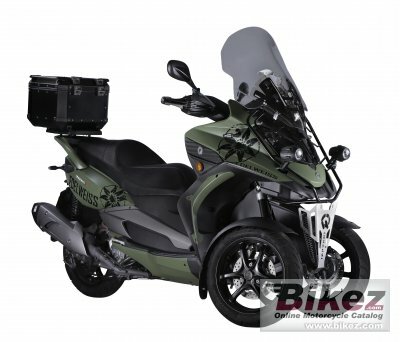 The new Edelweiss version transforms the Quadro3 into a vehicle that can adapt to any environment. In the city, it stands out for its sporting attitude and that special look that is impossible not to notice, while outside the city it blends perfectly into the landscape, without any worry of bumpy roads or off-road trails. Comments: Windshield. Two front wheels. Ask questions Join the 18 Quadro 3 Edelweiss discussion group or the general Quadro discussion group. Bikez has discussion forums for every bike. View comments, questions and answers at the 2018 Quadro 3 Edelweiss discussion group. You can sign up for e-mail notifications when other riders answer you. If you have extensive experience with the MC, please send us a review. If you consider buying this bike, you should view the list of related motorbikes Look at photos. Compare technical specs. And check out the rating of the bike's engine performance, reliability, repair costs, etc. You can compare the rating with other bikes.